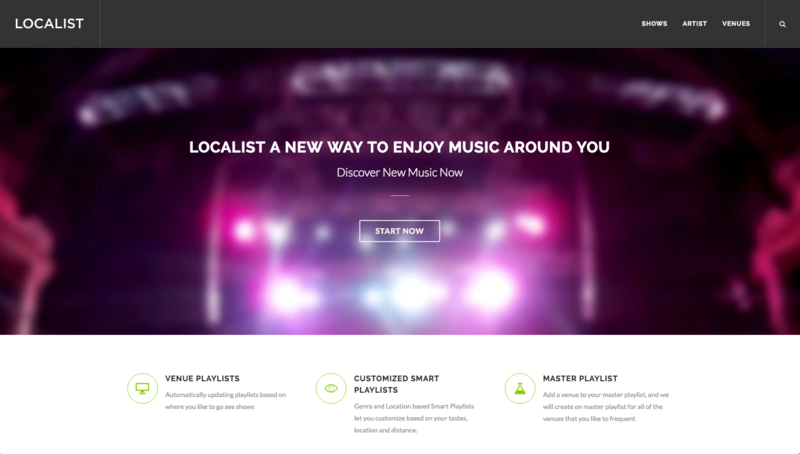 Localist is a social music aggregation platform that, creates customized playlists of music playing at local venues based on tastes, proximity and playlist history. In addition monthly and weekly playlists are automatically created for each venue based on upcoming shows. Localist utilizes Spotify, Echonest, and Jambase, to propagate the most recent content and asynchronously creates periodic playlists. Localist was in heavy development in 2015, in the hopes that it would be released in 2016. Two months before the beta release, Spotify announced the rollout of a similar feature within the Spotify ecosystem, essentially making the product obsolete.